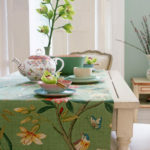 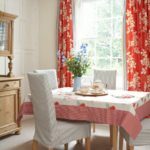 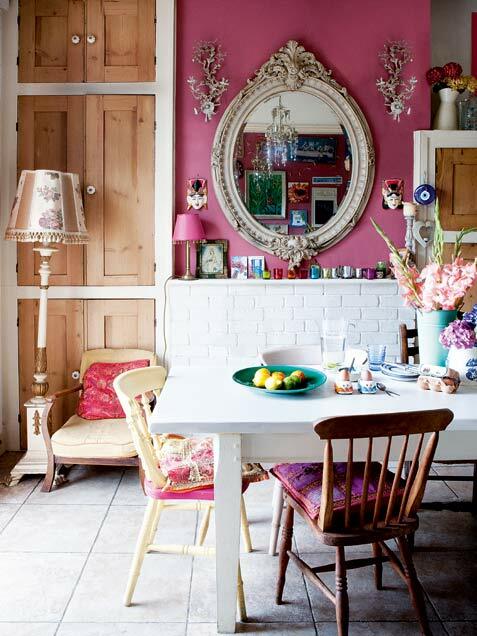 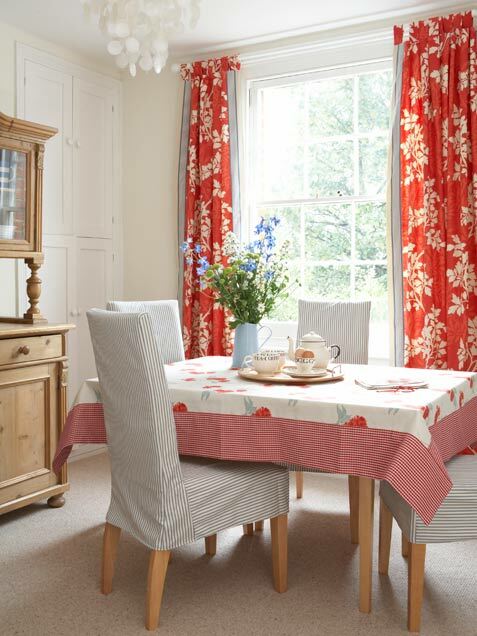 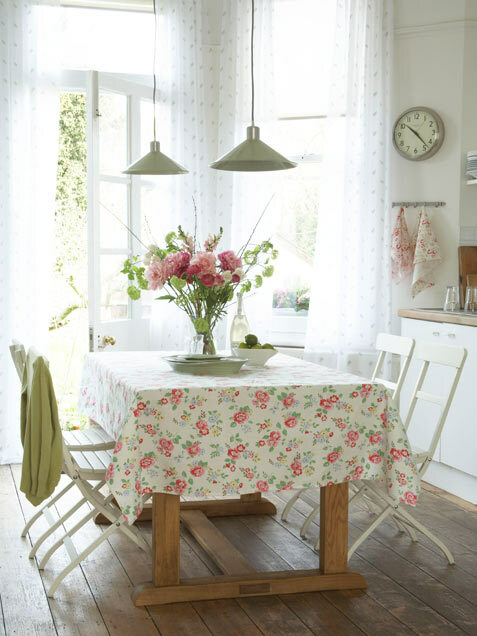 Fresh flowers and cheery floral textiles give this dining room a garden-fresh vibe. 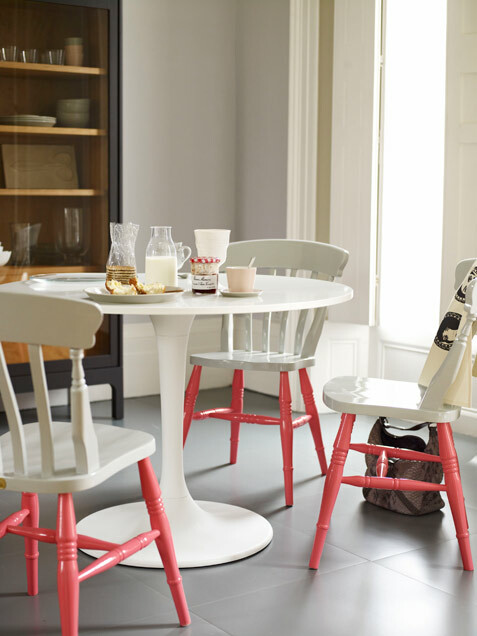 Modern white chairs tuck under a country-style farm table for a quirky mix of old and new. 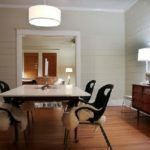 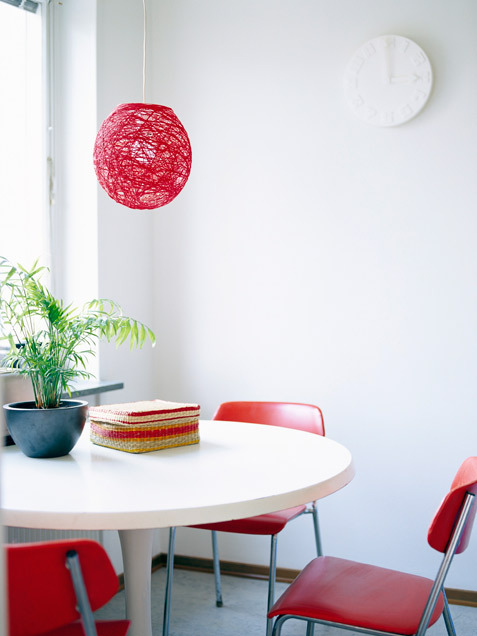 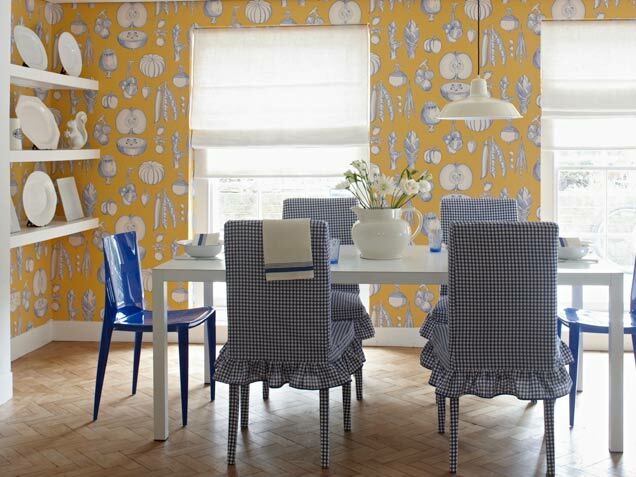 A warm wooden dining table and chairs feel fresh when mixed with modern pendant lamps and a graphic print. 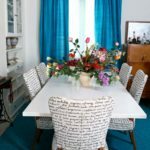 Word-printed fabric gives dining seats a patterned, graphic look that contrasts nicely against the bright aquamarine rug and curtains. 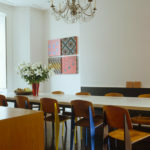 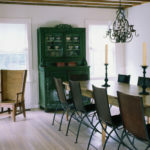 Mismatched contemporary chairs, an ornate iron chandelier and simple wooden furniture mix together for an eclectic look. 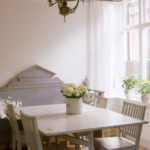 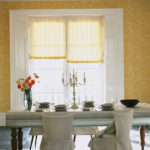 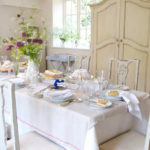 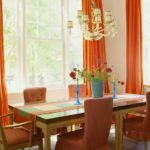 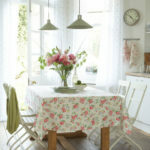 Gauzy curtains create a soft backdrop for a clean-lined table and chairs. 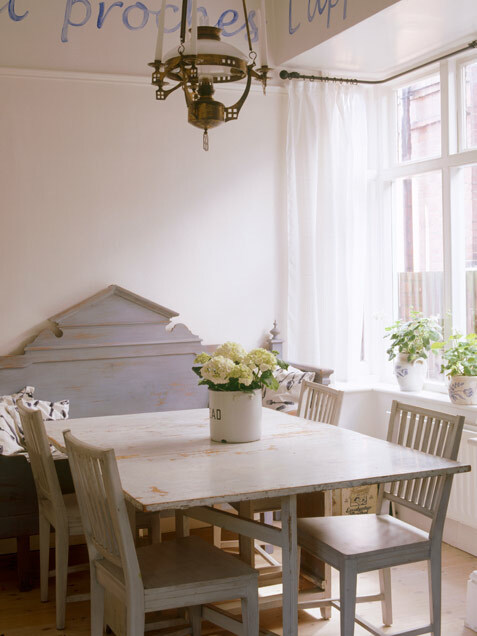 Design a room that’s cozy and comfortable with slipcovered chairs and a shabby chic table. 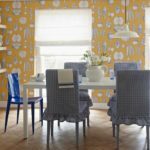 Vegetable-patterned wallpaper in a traditional color combination injects this seemingly serious dining room with subtle humor. 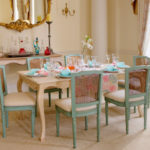 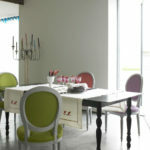 Dining chairs upholstered in different bold-colored fabrics give the room a lively yet sophisticated vibe. 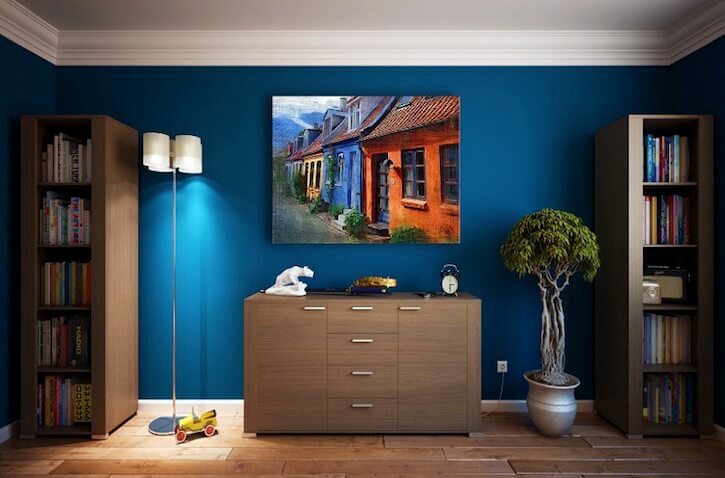 One hit of color, like an abstract painting over the fireplace, stands out in a neutral space. 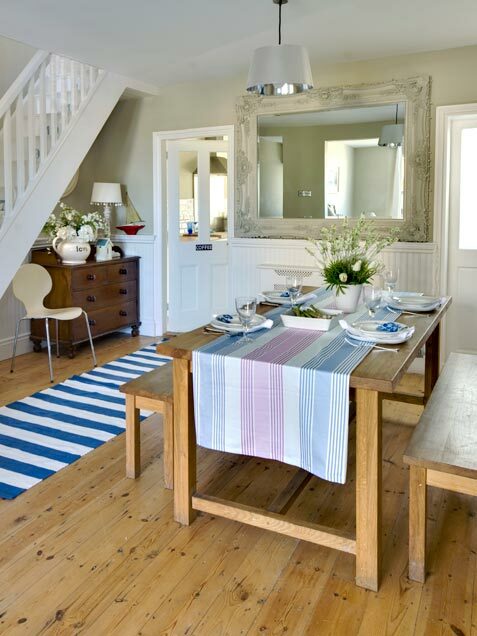 Long striped textiles lengthen the appearance of this petite dining room. 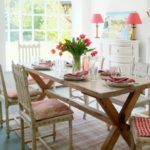 Slipcovering chairs—and even a table—protects the furniture and can hide stains and imperfections. 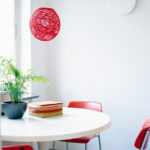 Mixing patterns is an aesthetic success when the palette—like this mix of reds and blues—is cohesive. 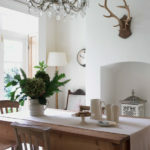 Leafy plants make great centerpieces and are an ideal complement to botanical textiles. 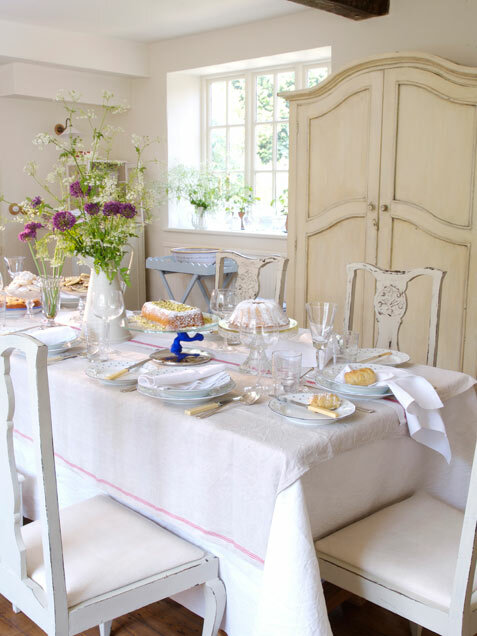 White china on white linens and a spray of wildflowers look elegant without seeming fussy. 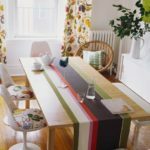 Rather than squeezing in chairs around the backside of a table, use a tall banquet bench that guests can easily slide in and out of. 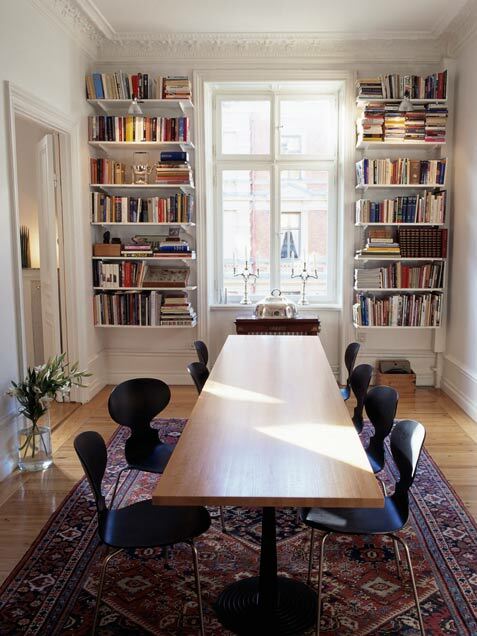 Keeping a dining room uncluttered and placing the table in the center accentuates its size. 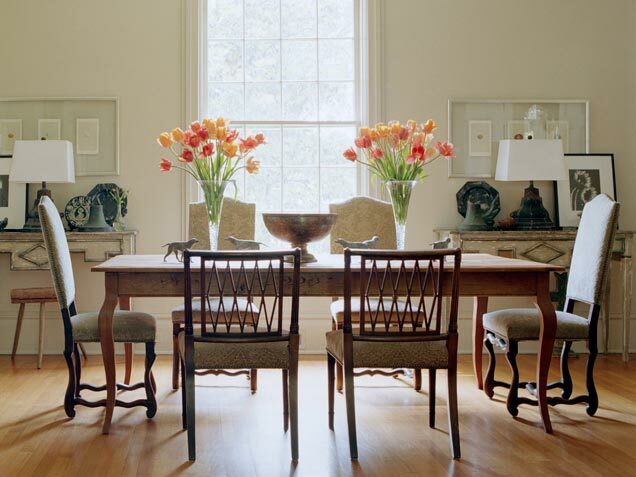 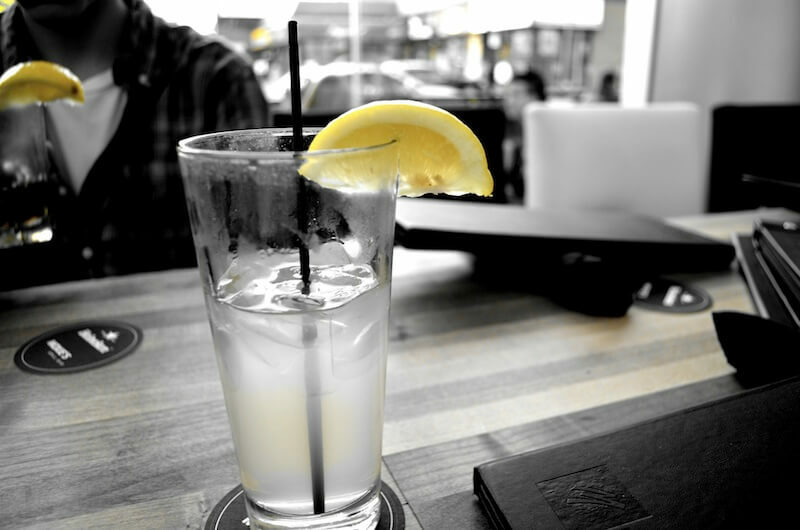 A large wooden table is a rough-hewn counterpoint to sleek molded-plastic chairs. 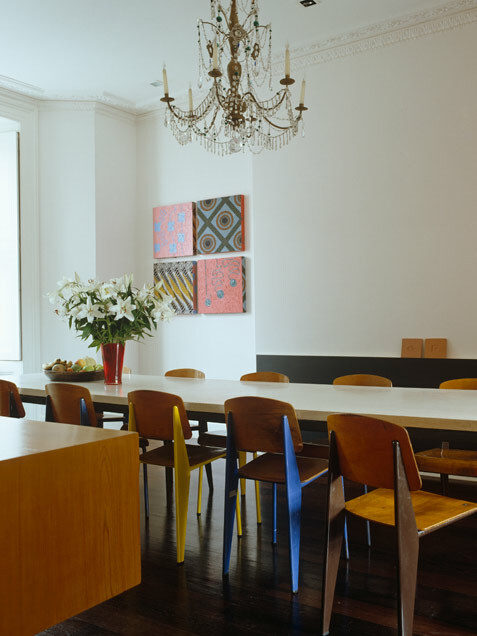 A multicolored geometric rug plays off the stark brick walls in this modern dining room. 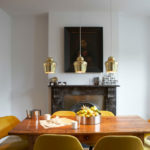 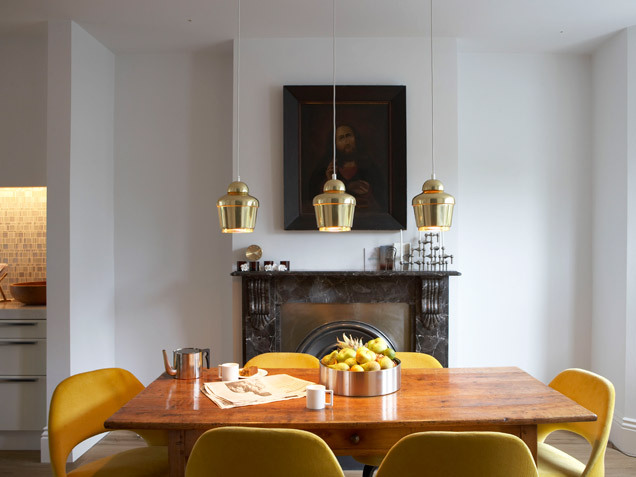 A trio of shiny brass pendant lights and lemon yellow chairs add elements of chic to an otherwise humble table setting. 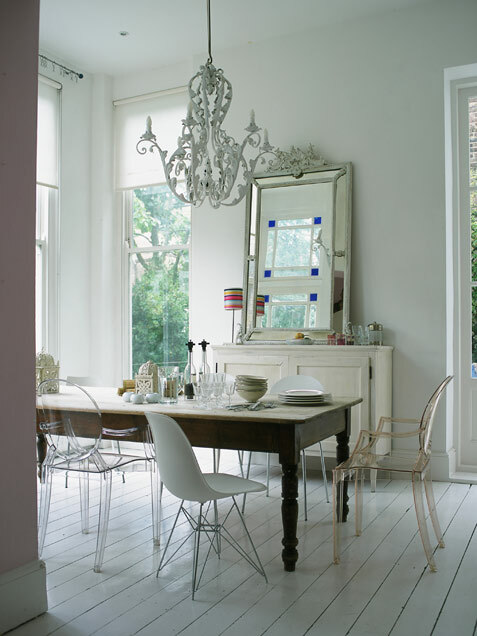 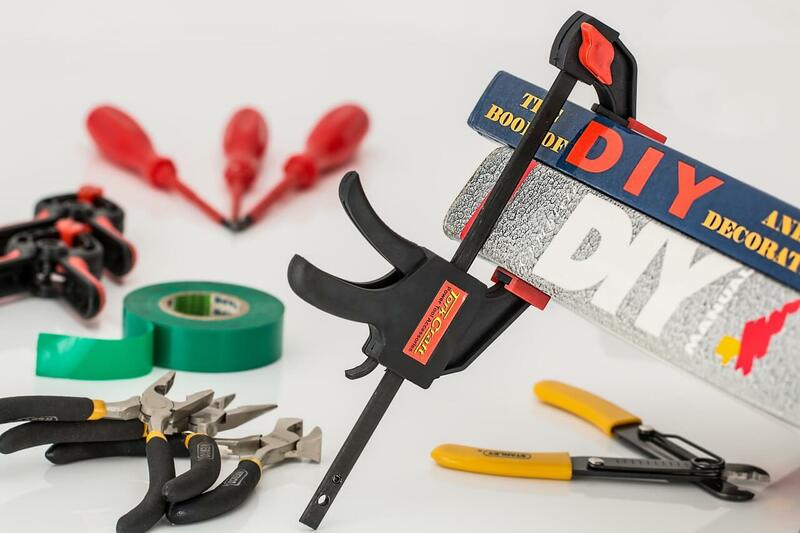 A delicate crystal chandelier is a pleasing contrast to sturdy workshop-inspired seating. 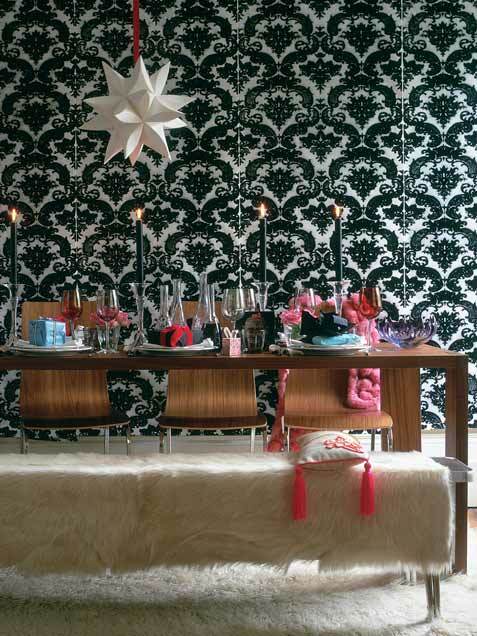 A flokati-covered bench and a warm walnut table and chairs soften the look of graphic damask wallpaper. 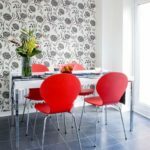 A leafy green room feels modern when decorated with black webbed chairs and a minimalist wooden table and bench. 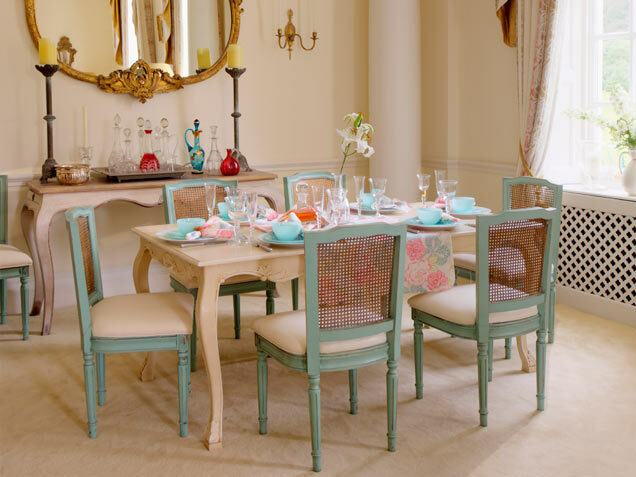 Delicate blue-painted chairs, a floral tablecloth and thin stemware give this dining room a feminine feel. 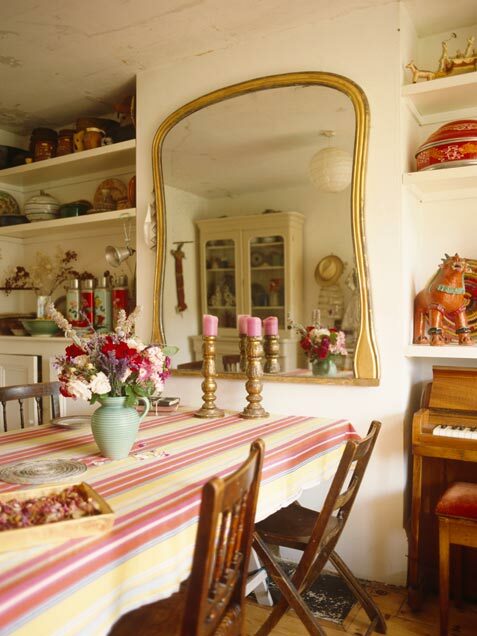 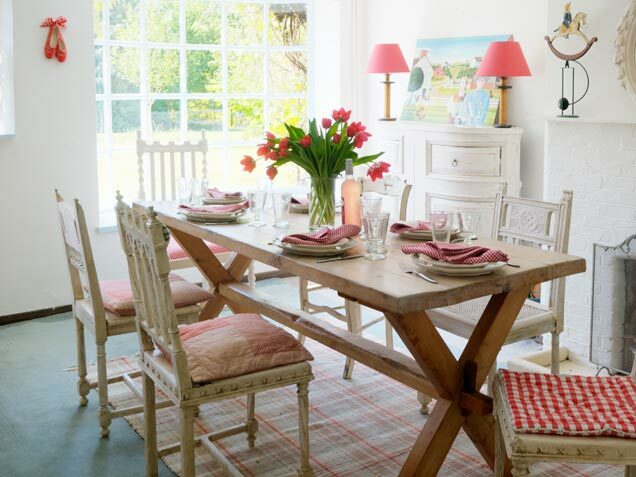 Mismatched chairs, striped linens and rustic pottery lend this dining room provincial charm. 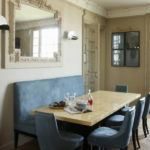 Sheer curtains and a coat of white paint keep rigid wooden furniture and an architectural bench from looking too heavy. 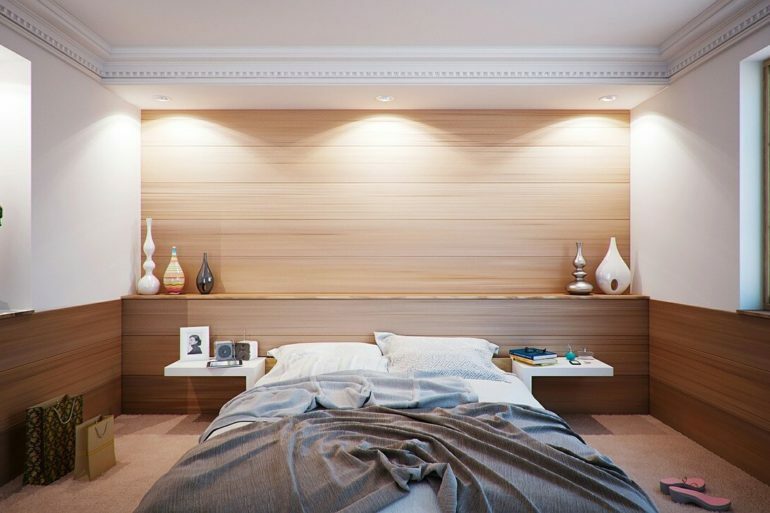 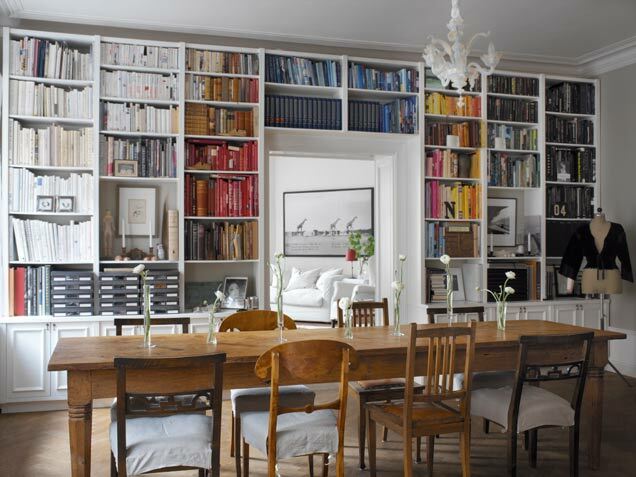 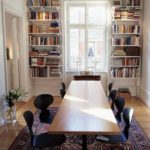 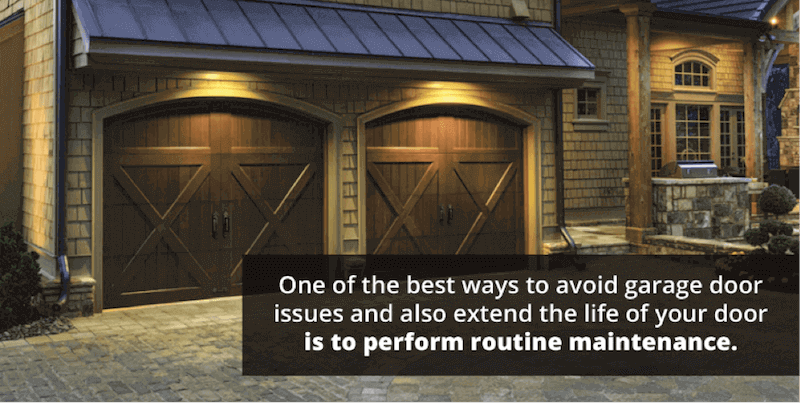 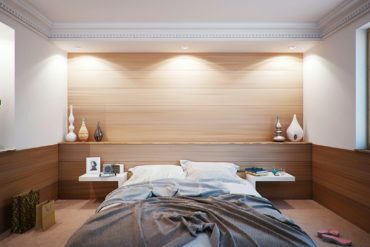 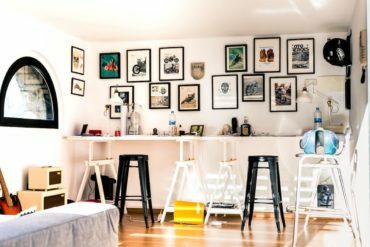 Storage is tricky in a long, narrow space; columns of built-in bookshelves at the end of the room are an ideal design solution and attractive look. 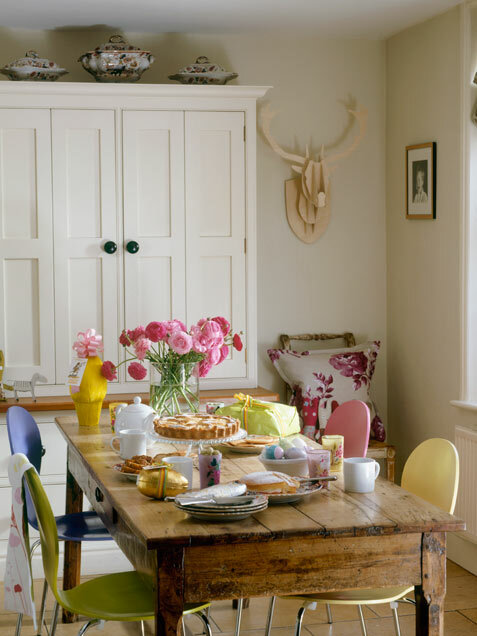 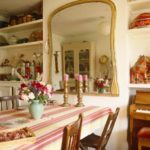 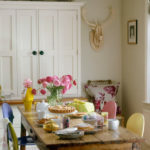 Colorful dining chairs and whimsical decorations lighten up a sturdy farm table and boxy cabinet. 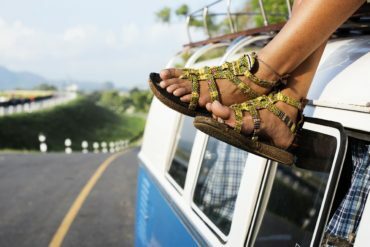 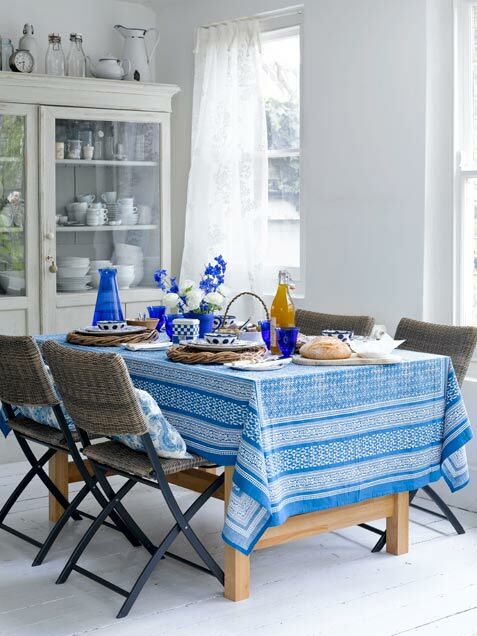 Keep a country look clean by sticking to crisp patterns and a fresh blue-and-white color scheme. 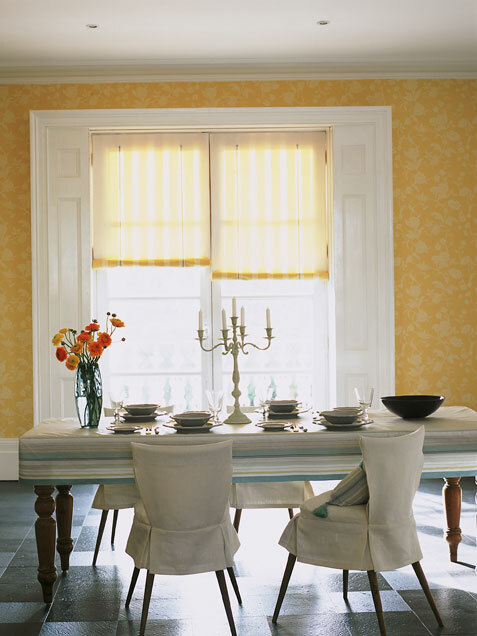 Mixing chair styles around a formal dining room boosts its charm factor. 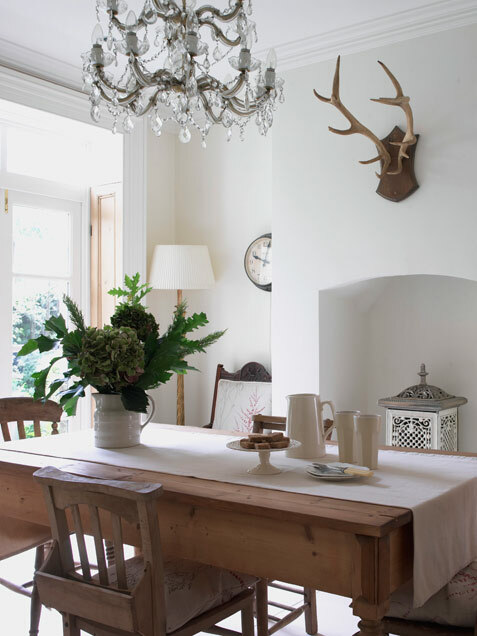 Mixing a crystal chandelier with dark wood furniture and antlers epitomizes chalet chic. 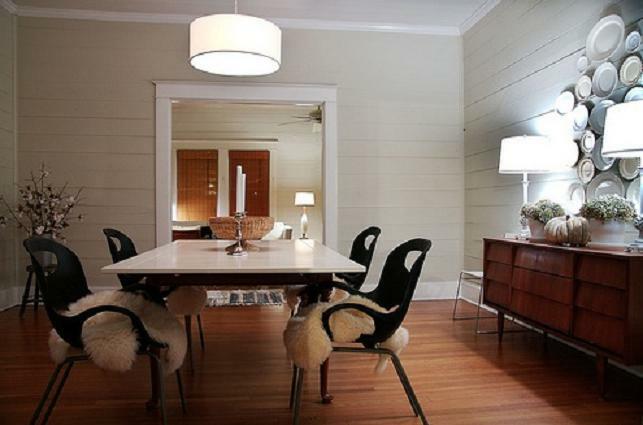 Fur throws are a comfortable and unexpected alternative to traditional seat cushions. 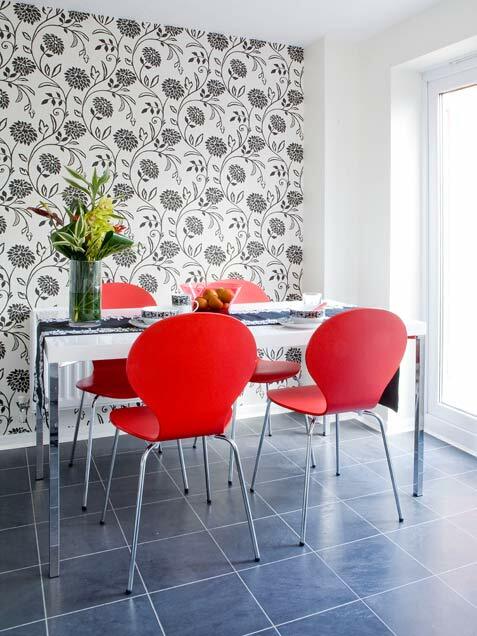 Bold red chairs pop against a graphic black-and-white floral wallpaper. 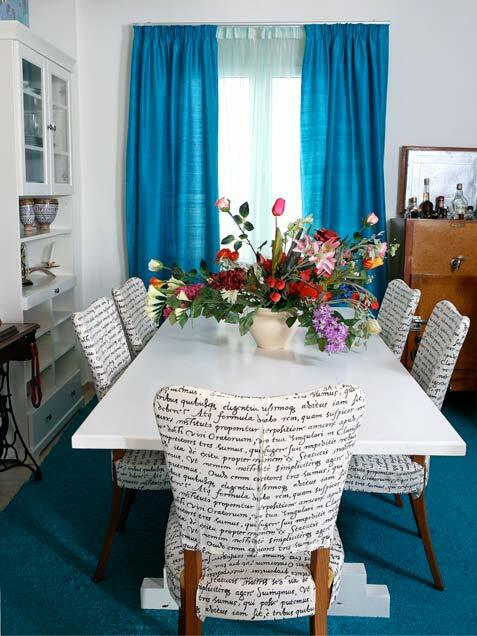 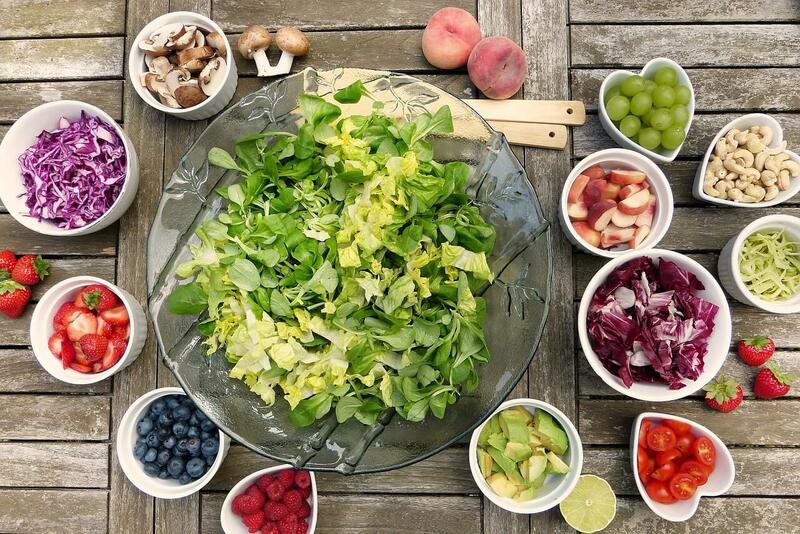 A runner is an underappreciated alternative to a tablecloth and can add an appealing splash of color. 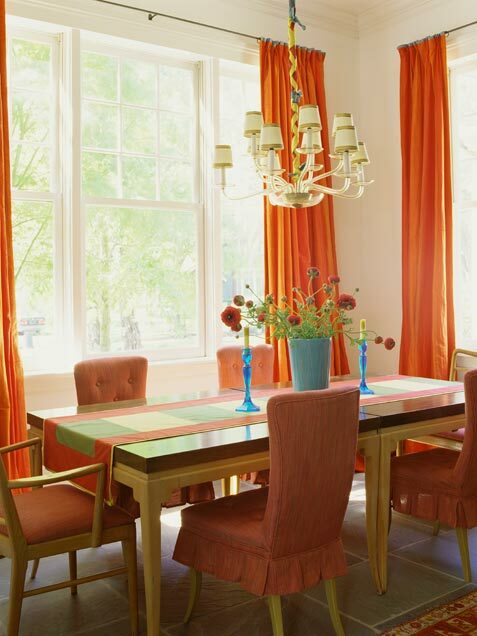 Don’t shy away from of a bold palette—deep orange and vivid turquoise is a pleasing combo. 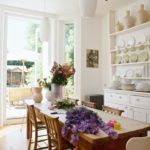 A contemporary white parsons table provides a nice contrast to the country elements, like the bentwood chairs and white ironstone pottery, in this dining room. 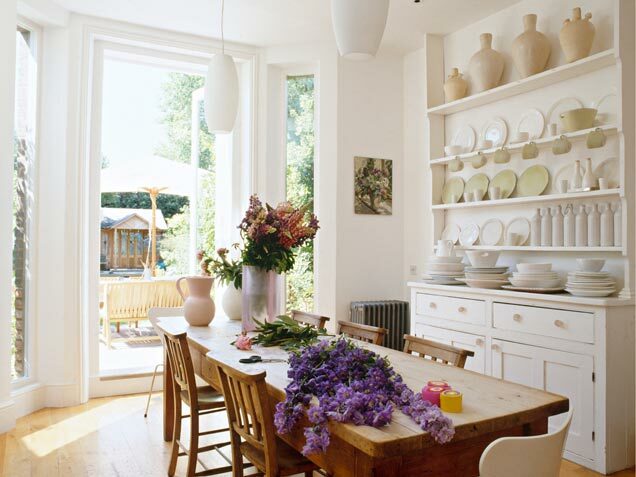 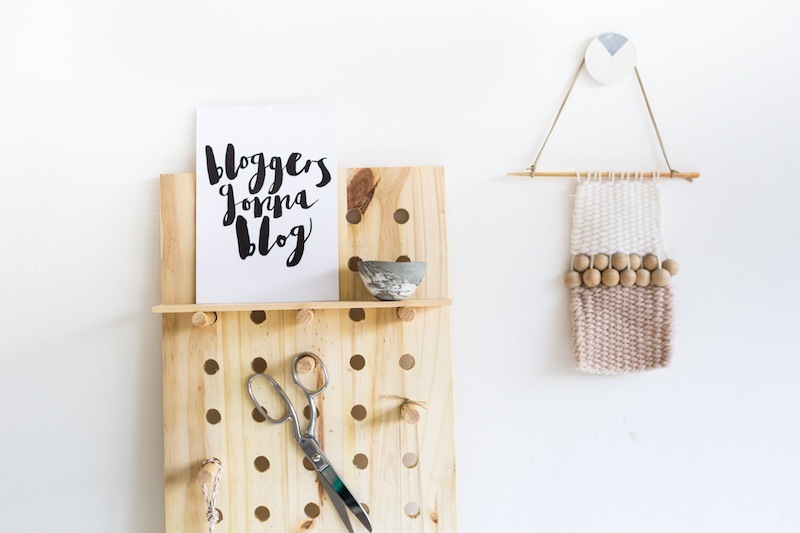 Open shelves proudly display a museum-worthy collection of white ceramics. 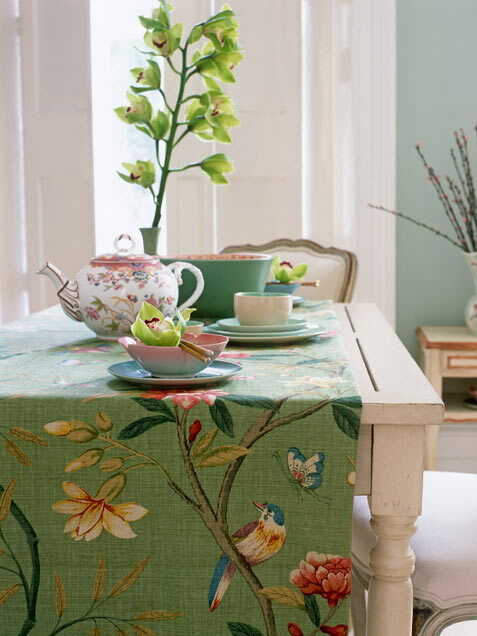 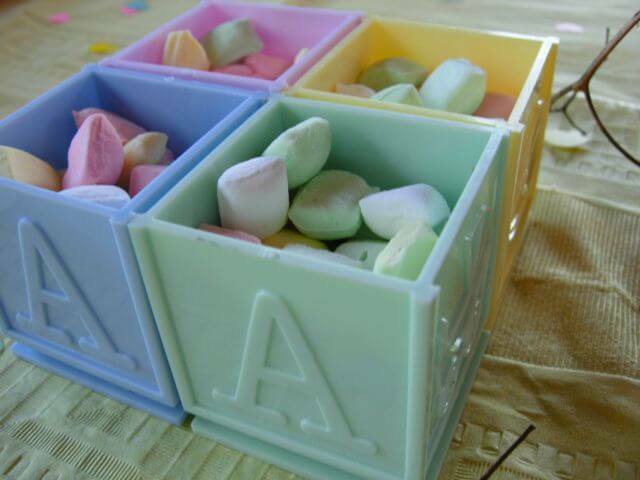 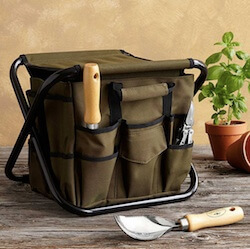 Expose a table’s lines by keeping it linen-free. 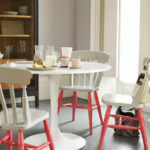 Painting wooden chair legs a bright coral gives them a unique and modern look. 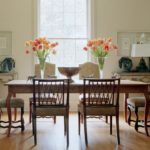 A collection of bud vases imprecisely arranged on a tabletop make a lovely alternative to the usual floral centerpiece. 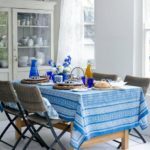 Blue table accents, like the glassware and the patterned tablecloth, enliven this casual eating space. 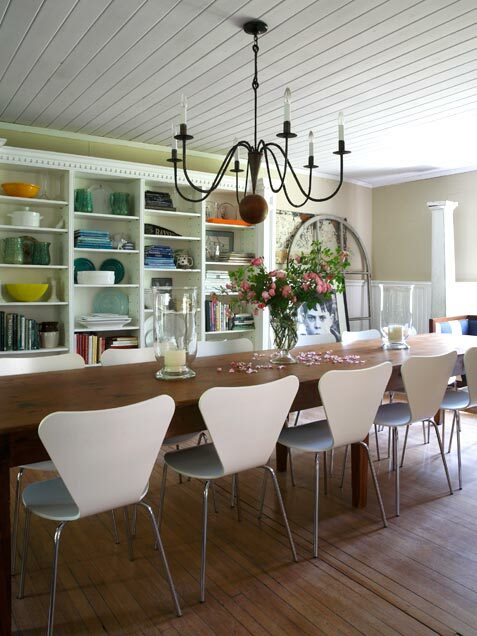 A long table with ample seating is ready to entertain a crowd. 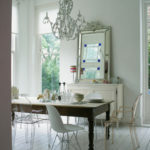 A collection of mounted antlers balances the feminine crystal chandelier with a masculine touch. 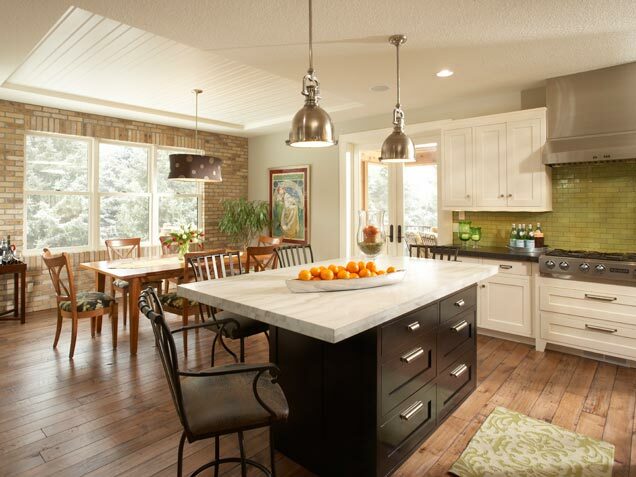 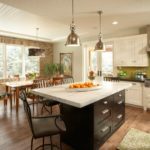 Open Dining: A large island and oversized lighting help to anchor a sizable kitchen space. 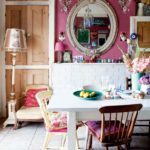 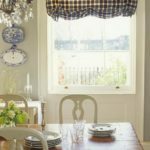 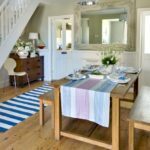 From country chic to modern minimalist and everything in between, we’ve rounded up 45 stylish ways to transform your dining room. 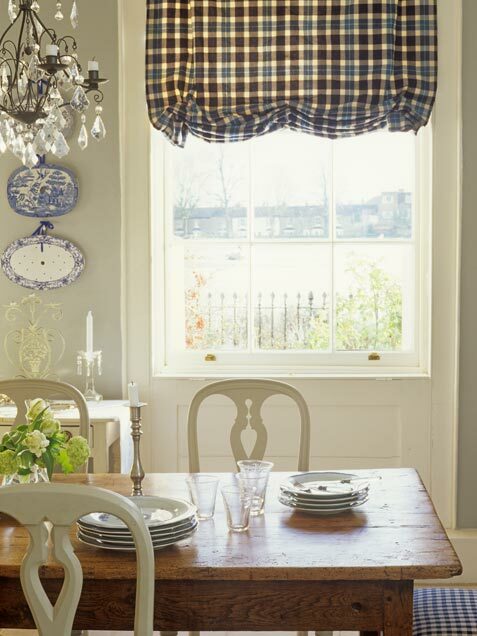 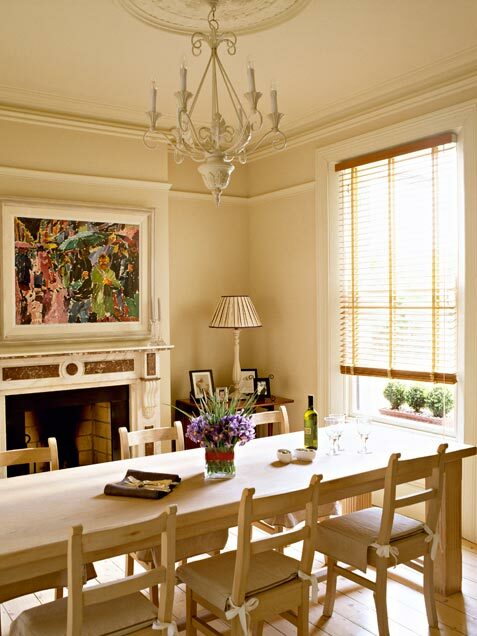 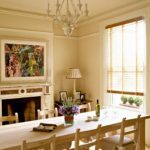 Browse through our dining room decor ideas and get inspired.